Another slow week, but next week should be more interesting. Cheap Thrills Digest: Formatting is done, awaiting cover art. The Adventures of Strongarm & Lightfoot – Assassins Brawl: More than a third of the way through the first draft. Got a few new pages done over the weekend and I figured out the climax, including what should be a brutal fight scene between Erika and the main villain. Action Figures – Issue Seven: The Black End War: About a quarter of the way through the first draft. Saturday, April 2: The Worcester Local Authors Fair, hosted by the Worcester Public Library. Runs from 11 AM to 2 PM and will feature workshops, readings, and local authors selling and signing their books. Saturday, April 30: The spring OtherWhere Market at Mill No. 5 in Lowell. Runs from noon until 6 PM with an after-hours party to follow. 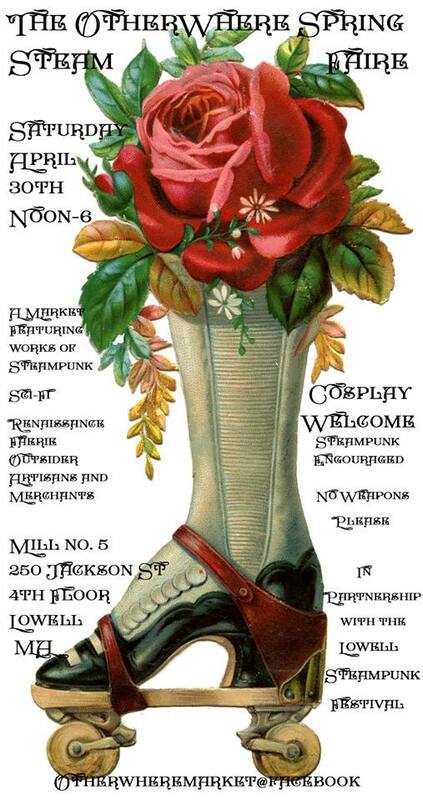 This year’s event will be part of a larger, citywide steampunk weekend. Not writing related, but significant. Our hot water heater started leaking sometime Sunday night/Monday morning and the water reached my comic book collection. Two garbage bags’ worth of comics were soaked beyond recovery. Fortunately some big-money items made it out okay, as did my coveted complete run of Neil Gaiman’s Sandman series. Some related mini-series were not as fortunate but the main series was never touched. Worcester Local Authors Fair Ahoy!